This is a very messy experiment so it really does need to be conducted outside on a nice day. Do not do this experiment inside!. 1.) Place the 2L bottle of Diet Coke on a flat surface and in a secure place outside. 2.) Remove the lid from the bottle of Diet Coke. 3.) Remove 4 mentos from the packet and get ready to drop all four of them into the bottle of Diet Coke as quickly as possible and jump back out of the way of the shooting rocket. It is amazing how quickly the mentos react with the Diet Coke and the amount of pressure build up that is released by spewing the cola into the sky. Try doing this experiment with a smaller cola bottle and dropping in two mintos. Another way is to do this experiment is to get an adult to put a small hole in the lid so that the cola can shoot out the top of the hole. If you try this experiment use peppermint lifesavers, extra strong mints or polo mints. Drop the mint in, screw the lid back on the bottle, shake it and hold it at an angle pointing away from you. 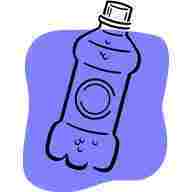 Shake the cola bottle a few more times to see how many time you can get it to rocket out of the bottle.